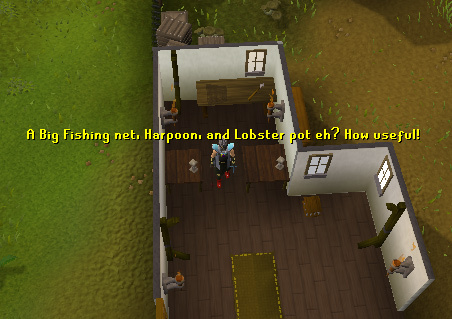 The Fishing Guild is a really good place to go fishing for several different species of fish such as Mackerel, Bass, Tuna, Lobster, Swordfish, and Shark as well as Casket and Oyster fishing. It's also good because it also has a range and a bank all pretty close together as well. 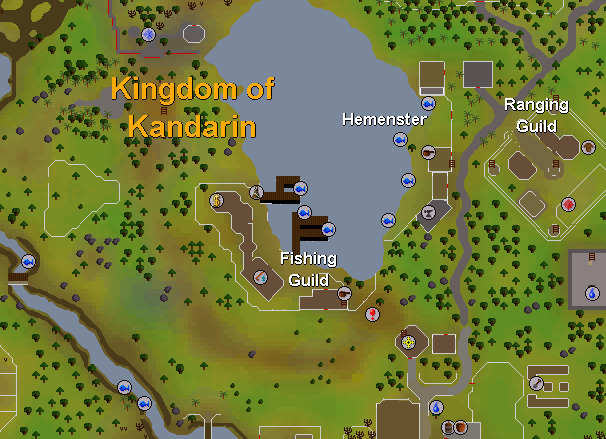 The Fishing Guild is along the south-western border of this lake north of Ardougne, don't be tricked into thinking it's on the east side of the lake, as that is for the Fishing Contest quest. The guild entrance itself is found near the south-eastern part of the border of the guild. At the entrance of the guild you should find the guild master/Master fisher wandering around welcoming those who talk to him at the guild and telling people about his skill cape. Three "Sick-looking Sheep (4)" can also be found around the guild which are used in the Sheep Herder and Mourning's Ends Part 1 quests. As you enter the guild, you'll more than likely notice that there's three respawns in the very room you just entered: A Big Fishing Net, a Harpoon, and a Lobster pot. These three items are the only ones needed to fish here. Both the Big Fishing Net and Harpoon are located on the table, and the Lobster pot is located on the floor nearby. 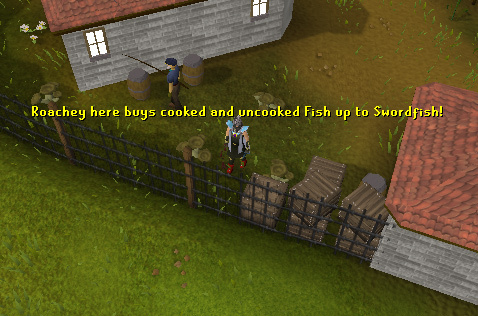 The next thing you should notice is slightly to the east of the respawns is a range, to which you can use to train Cooking as you fish your food. Many people go there to quickly cook their goods and bank afterward so they don't have to do so later on. As you go out the first room into the outdoors, you'll most likely a dock where people should be fishing. We'll get back to those later. If you walk west after exiting the first building, you should see a fishing store image on your mini-map. You should also see a guy named Roachey walking around near or inside of his shop. He'll buy any uncooked or cooked fish from Cod and up to Swordfish. He also sells you Feathers for 6 Gp and Bait for 3 Gp each and and infinite amount always as his default stock. He always has fish both uncooked and cooked at 0 as his default stock though. 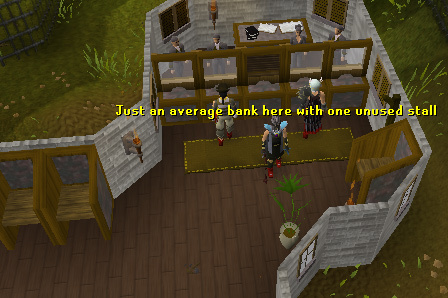 If you run north in the same building, you should end up at the bank of the guild, which is extremely helpful as people who are power-fishing are very close to a bank. If you run south-east slightly, you should find another door. 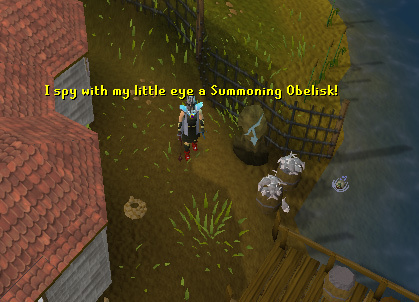 If you then run North, you can find a useful Summoning Obelisk that people often use to quickly refresh their Summoning Points if needed. 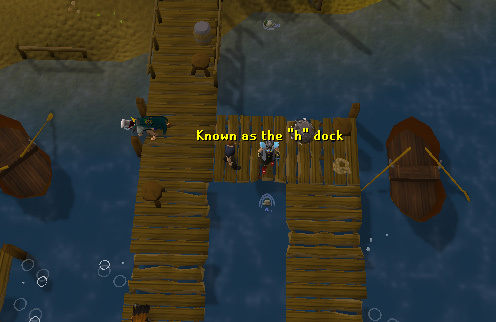 If you walk slightly to the south now, you'll see one of the two docks. The "h" dock if the dock people use the most often, as it's the closer to the bank than the second dock. The second dock is along the South part of the lake and is called the "F" dock for obvious reasons as well. 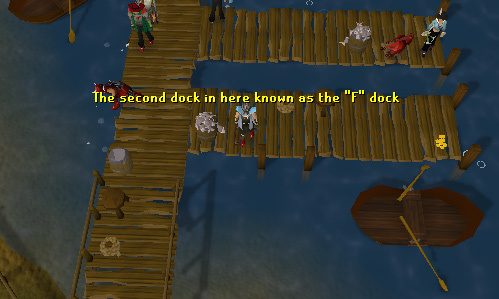 This dock normally has some people, but it doesn't have many most of the time. 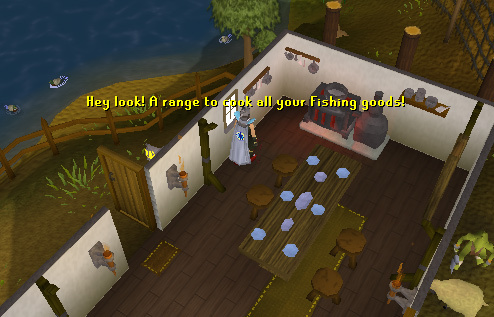 The Fishing Guild is an excellent and bright place to train Fishing, with a community always talking there and many ways to train the Fishing skill.